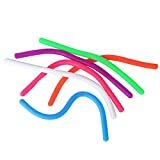 Set of 6 stretchy string for stress relief. Made of TPR material, safe for kids and adults. Can be stretched, pulled, twirled, wrapped or squeezed. String returns back to its original shape after each pull. Great for relieving stress and increasing focus. 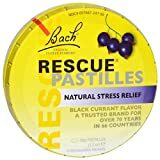 Bach Rescue Pastilles are tasty candy especially formulated using the Original Bach Flower Remedy formula for use by the whole family, including children.Dr. Bach formulated Rescue Remedy nearly a hundred years ago, yet never before has it been more relevant with millions of people relying on Rescue Remedy throughout the world to get themselves through the complications and shocks of life. Rescue Pastilles are ideal for coping with exam stress, driving tests, first day of school nerves, job interviews and high pressure environments. The funky tin with an easy “press on the lid” opening and closing mechanism. It is easy to take anywhere and with natural flavoring safe for use by the whole family. Active Ingredients: Star of Bethlehem: For trauma and shock.Clematis: For the tendency to “pass out”, and unconsciousness, being ‘far away’ and not present mentally.Cherry Plum: Fear of mind giving way, verge of breakdown, anger.Impatiens: For irritability, tension and fidgety.Rock Rose: For frozen terror and panic.Rescue Remedy Pastilles are made with Rescue Remedy original flower extracts. Natural ColorNatural FlavorNon habit forming.Sugar FreeAlcohol Free*4 Calories per pastille*0.5 Carbs per pastille.General Sale Dosage: Chew one pastille as required.Warnings: Excessive consumption may induce mildly laxative effects. May contain traces of gluten. SOLID METAL DESIGN outlasts and outperforms the competition. 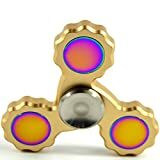 Don’t settle for a cheap plastic spinner. QUIET AND DISCREET. Perfect for use in class or meetings. PREMIUM PRECISION DESIGN. Each unit is meticulously crafted to ensure the highest quality. R188 hybrid bearings offer smooth performance and long spin times. REDUCE STRESS AND ANXIETY while increasing focus and concentration. Perfect for those with ADHD, autism, or anyone who has trouble with focus or stress.